Today's illuminating article traces the history of Newark's street lights. One of the basic purposes of a local government is to provide protection for those who live within its boundaries. This means providing safe conditions for its residents, paving over the muddy streets for the rainy season, providing sidewalks, and illuminating the area after sundown. By providing these fundamental amenities, a community becomes a safe haven for its residents, a good environment for doing business, and a generally all-around pleasant place to call home. In Newark, 1836 was a turning point because in that year the legislature created the city from the old Township of Newark, adopted a city seal which it still uses, divided the municipality into four wards (North, South, East and West), established a school system, and moved its first government into the Newark Academy. Later, the cornerstone was laid for the City Hall/Court House complex, and the city built a public or farmers market for each ward. That also was the year when Newark began to light its streets with oil lamps. Indeed, on the eve of becoming a city, Newark had become the 'mold of fashion,' a place where everybody wanted to live and do business. Remember the McCarters who moved here from Sussex County, and the Frelinghuysens who built their home on Washington Street? At seven months old, Newark introduced oil lamps. At first, they were confined to the center of town, but they were later extended into the city's residential section. By Dec. 25, 1846, the Newark Gaslight Co. began manufacturing gas which was used to illuminate the downtown, and by 1853 lamps were supplying 2,200 hours of gas for lighting at the rate of $28.50 for each of the 337 units – a price well within the reach of the young booming metropolis. By the 1870s and `80s the entire concept of outside lighting had changed. The tallow wax candles carried in coach lanterns of the 18th century, and the flickering gas lights of the 1850s were being replaced by modern electricity. At first, the electric carbon arc light was used but its blue light was considered unflattering to many, and was replaced by a reddish illumination that gave its observers a healthy glow. In 1877, Edward Weston, Newark's genius electrical inventor and colleague of Thomas Edison, perfected an arc light for the corner of Washington and Market streets. So bright was the light that he would notify the fire alarm tower whenever it was turned on to prevent calling up of the fire brigade. The following summer, the City Council allowed Weston to install one of his arc lamps in Military Park. The 7,000-candle power drew public attention as well as millions of summer-time bugs. Newark was not Weston's only outdoor lighting project, for he was involved in similar ventures in Boston, Bergen County and Coney Island. His greatest achievement was illuminating the Brooklyn Bridge in May 1883. Success followed success, and resulted in the establishment of the Newark Electric Light and Power Co. on Mechanic Street in 1882. Weston came to Newark as an electroplater and became interested in outside lighting. By 1886, his interest shifted from outdoor lighting to pioneering the new art of electrical measurement – a new interest, a new career and a new chapter in his life. In 1882, the first electric street lamp was introduced, an open arc light as opposed to the flickering gas flame. By 1898, a new type of electric street light was introduced which was known as the closed arc light. By 1904, the city began to install street lights in the business section of Broad Street, wired by underground conduits, and in 1908, the Welsbach gas mantel lamp was installed. The 1909 Report of the Board of Street and Water Commissioners indicated that a variety of outdoor lighting was used that year, including electric arcs, flaming arcs, electric incandescent, gas lamps with open flames, and gas Welsbachs – an amazing variety of equipment in a transitional lighting period. Also in 1909, the section of Broad and Market streets, the Four Corners became known as the 'White Way.' In 1914, the Mazda nitrogen-filled electric street lamp was introduced by the city. This was done in part to protect pedestrians from night traffic, and to encourage more downtown commerce. By 1921, Newark again installed new lighting along Broad Street with 1,500 electric street lamps containing closed carbon arcs. An effort was made at the same time to light all city intersections. By 1924, gas street lamps were gradually disappearing from the residential districts. The last gas light was removed in 1926. For almost 100 years, Newarkers did their best to illuminate their city at night. But in 1941, with the coming of the Second World War, they reversed their activities and prepared to darken their city. At that time, 428,000 Newarkers were instructed how to hide under darkness in case of air attack. It was the job of the Newark Defense Council to protect the town. On May 24, 1941, Newark became the first major East Coast city to practice blacking out so that if we came under attack, as in the case of war-torn London, citizens could react without panic. Air raid wardens were put in charge of the operation, and the activity was reviewed by the Senate Military Affairs Committee and the U.S. Army. The U.S. War Department was interested in the operation because of the vital harbor and the five major railroad trunk lines, large industrial complexes, as well as important business and large residential areas. Not only was this major seaport open to possible air attack, it was vulnerable to submarine attack. Eighteen hundred wardens were selected for the mock air raid. Each one was deployed to visit the homes and businesses within a certain district to explain the exercise and to ask for cooperation of residents. The air raid was to be sounded on a Monday in May 1941 at 12:15 a.m. There was to be a two-minute continuous blast announcing the beginning of the raid. All lights were then to be extinguished for 15 minutes. Army planes were to fly over the city during the exercise and take photographs. The city was to be blacked out with the exception of Routes 25 and 29. According to one report, 'The only air raid precaution expected of anyone at home at this time was the extinguishing or covering of all lights and locking of doors and windows. 'Families should be told also that if they intend to have lights on during the blackout, they should try their blacking-out methods in advance of the evening of the blackout. During the blackout, the air raid post warden must see every dwelling in his area to make sure that no lights are visible. The post warden must also see that street traffic has stopped and that all car lights are out.' And so Newark joined with the rest of the nation in a war-time exercise. A review of street lights includes the 'post-top unit' with metal cast base of moderate design and an urn-shaped light on top. This type of fixture has been duplicated in the Central Ward's Society Hill complex. 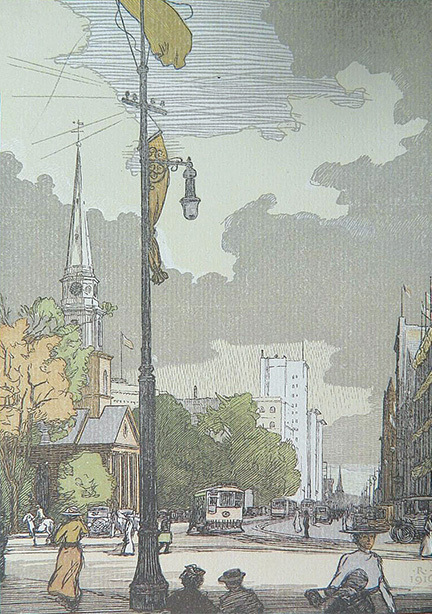 Another fixture was the ornamental trolley-pole bracket, a pendant street lamp attached to an ornamental pole base—the type that was widely used along Broad Street and rather elegant in design. In less 'glamorous' sections of town, the light stand was the same elaborate bracket on a plain pole. In industrial neighborhoods, an iron pipe extension arm was placed on a simple wooden pole. The latter fixture had absolutely no decoration. In 1982, 2,500 new sodium street lights went up all over town and were touted as big energy savers. Installed by Public Service Electric and Gas and funded by the Housing Community Development Act, new lights were placed on older poles and mercury vapor lights began replacing incandescent or fluorescent lights. Today, the city was taking on the soft glow of rose colored lights, replacing the colder green-blue shades of an earlier era. Streets lights also are being used to highlight neighborhoods within the community, such as the newly installed 'period lights' in the Historic James Street Commons and the double light stands which complement the nearly completed New Jersey Performing Arts Center. Illuminating, protecting and historically enhancing the city at night are all functions of street lighting that watch over the city as its sleeps.